As you know by now that I love good food but what you do not know is that I am crazy for panner. If you haven’t read my About page, probably you do not know this story. Like other foodies I also crave for tasty food. But for me I crave it at weird times (nahhh I am not pregnant). So that reminds me of me making a Paneer Butter Masala when I was preparing for my finals in Idaho… and guess what time did I make it? 3 AM…yes, at 3 AM!! See that’s the perfect example of me not compromising on good food and how crazy I am for Paneer!! And BTW I got A- in my final 🙂 So it was worth an effort. Right? Most of you are familiar with Paneer but if you are not, Paneer is a fresh cheese made of milk and lemon juice. Very easy to make and super delicious.You can make it fresh and use it the same day. 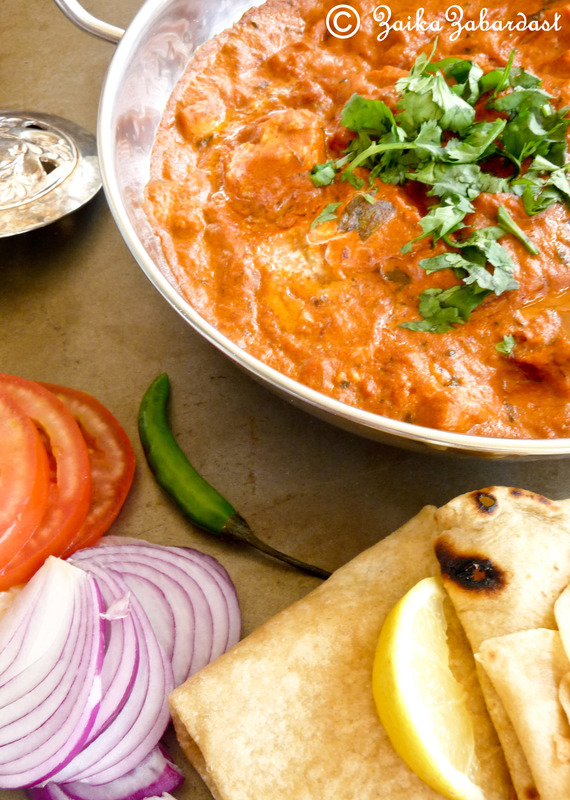 Paneer is such a versatile ingredient that you can prepare your entire meal out of it. 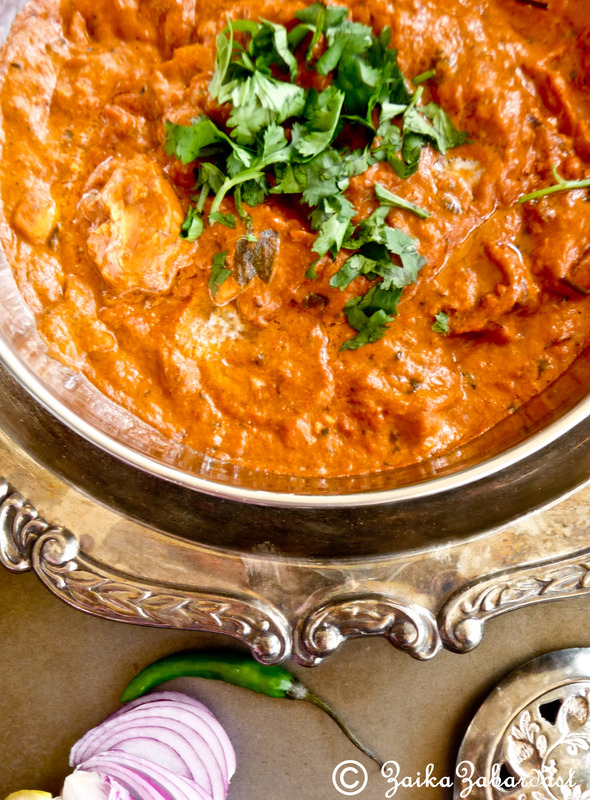 One of the most popular curries of Paneer is Paneer butter masala. 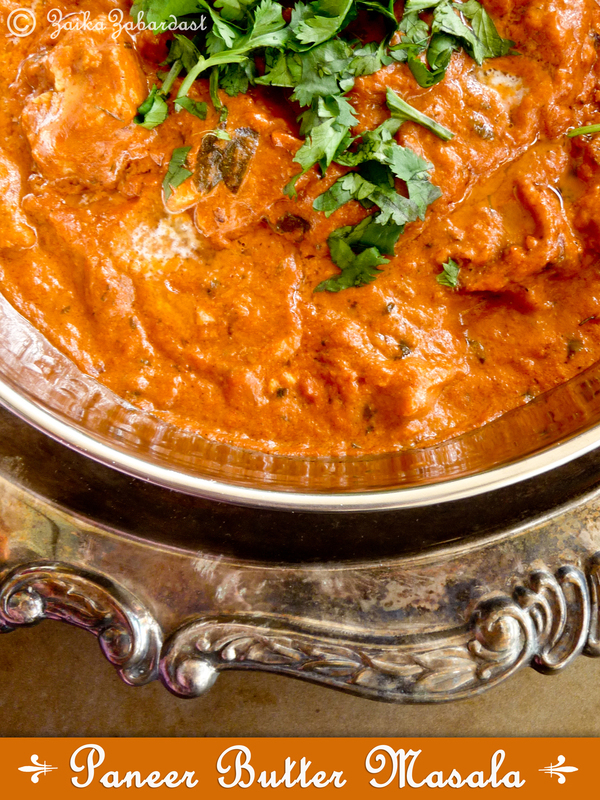 It is cooked in a rich buttery onion-tomato gravy and flavored with bitter fenugreek leaves. I added almond paste to make the curry more flavorful and rich. If you prefer healthier version of this you can cut back on butter and use half and half and not heavy cream. You can enjoy this Paneer butter masala with Tandoori naan/roti or just serve it with plain jeera rice. I also tried making Roomali roti but it was not a successful experiment so I am not posting the recipe for it. 😦 But I will keep trying. So, here I present you my awesome recipe of an Authentic Paneer Butter Masala. Soak almonds in half cup of milk and set aside. Heat one Tbsp of oil in a pan. Add chopped onions and sauté it for about 10 minutes on medium-high flame till they are translucent. Add a pinch of salt to it. Keep it aside. Let it cool down a bit and purée it in a blender. Now in a big pan add butter and a Tbsp of oil. Do not skip on oil otherwise your butter will get burnt. Once oil/butter is hot enough add bay leaves, cumin seeds, cinnamon sticks and red chillies all together. Sauté for about 30 seconds on medium heat. Now add ginger-garlic paste and sauté for another 45 seconds. Add onion paste and cook for another 2 minutes. Once onions are cooked, add tomato paste /puree, coriander-cumin powder, garam masala powder, red chilli powder, paprika powder, and salt to it and cook on high heat till oil separate. It will take about 10 minutes. In between purée almonds with the milk. Once tomatoes are cooked add almond mixture and ketchup to it and cook for 3 more minutes. Add paneer pieces and salt (if needed). Cook covered on low heat for five minutes. Sprinkle kasoori methi and mix in lightly. Thr bitterness of Kasoori methi will balance out the flavors of ketchup. Remove from heat and mix in the heavy cream/half and half (I used half and half to cut back on some calories ;)). If you are using half and half you need to let the curry cook for 5 more minutes. But if you are using cream no need to cook further. Taste and check the salt amount. Add more if requires. Garnish with chopped coriander leaves and some cream if you prefer. Amazing clicks and yet another amazing recipe! Loved reading through it all. Bookmarked this along with your soup n bread n pav bhaji! Love. Ya Grishma restaurant order can’t be complete without a paneer dish…you have made it look so pretty…and the taste..mmm…can just imagine the paneer melting in my mouth…superb. Thanks for the recipe! It turned out great! It was a little on the sweet side, maybe because of the kind of Ketchup? What kind of Ketchup do you use? Also, do you recommend anything to thin the sauce out a little? I am glad you liked it! I usually put some water or half and half to make the sauce thin and also about the ketchup I always use organic ones. I like this curry bit on sweeter side but if you prefer to cut back on sweetness, then you can try using half the tomato sauce and half the ketchup. I hope it helps and thank you for trying my recipe! I am so happy to hear that, Cashews are always good substitute of almonds. I never tried raisins though, I am sure it was good. You can always use mild chili powder in place of paprika. It works just fine. Basically it is only used for color – so no big deal! Dear Meena, I very much appreciate your comments and I would try to post more Indian stuff that you have mentioned above. Thanks for kind words 🙂 Have a wonderful day! This was delicious recipe, I and my wife realy enjoyed it. Hi I made this today and it turned out to be awwwsum!! My whole family enjoyed it, thanks Greeshma, post more!! Bull’s eye absolutely!!! I have been instructed not to make again otherwise we wouldn’t have anything to eat if we go out for dinner 😀 thanks a ton!! Awww…that’s very sweet of you Vrushali 🙂 I am so glad everyone enjoyed it. Anush, I am glad you liked it. Thank you for visiting my blog. can i use regular onions instead of red onion? Hi.. Your recipe looks so yummy.. Can i use half and half available in usa?? Cos i am living in states..
Bharathi, of course you can. I believe I am little late to reply but for the next time, yes!